He was born at the beginning of the 18th century on the island of Kythnos in the village of Thermia. He was the scion of the well-known and devout Yezedinos family. As a young man he went to the Holy Mountain, where a relative was a monk at the Monastery of Vatopaidi. Because he loved the monastic state with his whole heart, he abandoned every worldly vanity and was tonsured a monk with the name of Ignatius. Later he was ordained priest. Because of his virtue, he was invited to be the shepherd of a far-way flock, which was under the harsh yoke of the Tartars. In 1769, he was consecrated Bishop of Gothia and Kafa in the Crimea. He was known as a kind-hearted and indefatigable bishop, who won the love and respect of his downtrodden flock. As a reward for his great service, the Patriarch of Constantinople gave him the title of Archbishop and made him a member of the Holy Synod of the Ecumenical Patriarchate. His contemporaries considered him an honorable man, devout, moral and vigilant. He was of peaceful countenance and angelic temperament; experienced in matters of the Church; and had many natural talents and abilities. With these endowments, he was destined to become the new Moses to his enslaved flock. He undertook the onerous and difficult task of organizing the exodus of the Orthodox from the Crimea, which was under the Tartar yoke, and leading them to the Christian region of the Sea of Azov, which was under Russian suzerainty. Having tearfully prayed for years to God concerning the harassment of his flock, he decided on withdrawal from the Crimea peninsula. He was well aware of the immediate danger to the Orthodox Christians, in terms of their spiritual and physical elimination. He began secret talks with the Russian government and managed to complete a record of the Russian, Christian population of the Crimea. After the Divine Liturgy on 23/4/1778 in the cave church of the Skete of the Dormition of the Mother of God, he told the faithful to prepare to leave the land where they had been enslaved and humiliated for so many years. People he could trust told all the faithful on the peninsula the precise details of the departure. The Tartar authorities were caught completely by surprise and so were unable to hinder the mass of people. The people had to leave their property, their houses and their land, their churches and the graves of their ancestors. The long and difficult march began in June 1778. They bore before them the Bakhchisaraï icon of the Mother of God, which protected them. Their spiritual leader was Bishop Ignatius. About 50,000 Greeks abandoned the Crimea which was occupied by the Turco-Tartars. For his courage, daring, bravery and achievement, the Empress Catherine awarded him a high honor: the adamantine pectoral icon of the Mother of God. Through the prayers of their good and faithful shepherd, the refugees overcame many difficulties, privations, and illnesses on their long march. 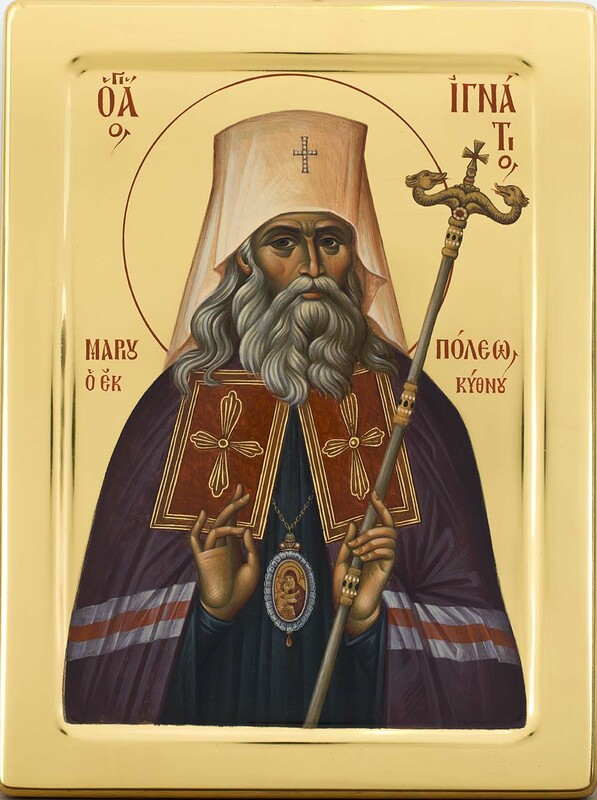 When an unknown, terrible epidemic attacked them on the road, the holy bishop prayed fervently to Saint Haralambos the wonder-worker, who appeared to him in a vision and assisted the people”. On the Russian coast of the Sea of Azov, where the Greeks settled with the blessing of Metropolitan Ignatius, the large and beautiful town of Marioupolis (Mariupol) was founded, dedicated to the Mother of God, with 23 Greek villages in its environs. A new metropolis was created in Mariupol under the spiritual supervision of the venerable hierarch, who now belonged to the jurisdiction of the Russian Orthodox Church. The first concern of Metropolitan Ignatius was the constant spiritual guidance of his flock. The difficulties and problems of the new location and the constant attacks by the Turks in an effort to force them to return to the place they had abandoned made the Greek refuges frightened and worried, so that they sometimes complained to the bishop about their numerous tribulations. The saintly bishop was neither deterred nor defeated, but recalled the exodus of the Jews from their slavery in the land of Egypt and their continuous charges against Moses, their liberator and leader-in-chief, who had beheld God. The faithful servant of God Ignatius loved the Lord with all his heart, strength and mind, and so bore with his flock and recognized that they had lived a life of suffering and that some of their travails were still continuing. He used to say: “Through the Church and from the Church springs the blessing of heaven and its benefits are patently obvious in all human tasks and occupations”. And so he dealt with everything with prayer, patience and gentleness. Living in the stone cell he himself built 6.5 kilometres outside Mariupol, he gave up his spirit peacefully to his Creator on 3/2/1786, after a two-week illness. He was buried in the first church in Mariupol, that of Saint Haralambos, where his grave later became an important pilgrimage site. The devout inhabitants gratefully honored their holy spiritual father who had become their liberator. In 1936, after the terrible atheist regime came to power, the church of Saint Haralambos was destroyed. They opened the grave and found that his holy relics were incorrupt. Later they were taken elsewhere. In the course of the liberation of Mariupol, the city was burned by the Germans and the relics of the saint suffered the same fate. In this way, a prophecy of the saint was fulfilled, for he had said that his relics would be burned along with the city. A portion of his bones were saved, however, and are now kept in the church of Saint George, in Mariupol. In 1977 he was recognized as a saint of the Ukrainian Orthodox Church and he is commemorated on 3 February. On Saturday, October 1, 2016, along with the reception of the Holy Relics of Saint Ignatius of Mariupol Ukraine, born in the island of Kythnos took place and Sunday, October 2, 2016 the Municipality of Kythnos and the Municipality of Mariupol in Ukraine became officially twin cities. It is a unique historical event that has gained an international dimension in the Orthodox ecclesiastical history. At the request of the Eparch of Syros Dorotheos II, a part of the Holy Relics of the saint was donated to Kythnos by the delegate of Eparch of Donetsk and Mariupol, Mr. Hilarion and the priest Vadim Utkin and is placed in the sanctuary of the Holy Trinity in Chora of Kythnos. By a decision of the Eparch of Syros, a new local religious feast for the island was established and every year, in the end of September, celebrations take place in honor of the saint, with the participation of state personalities, politicians and clergy, as well as of the entire society of the island.